After a rotten day, I trudge home, feeling sorry for myself. I'm certain that the headache that's rattling my brain like bass blaring out of a cheap car stereo can only be caused by one thing: a grey hair making its debut on my scalp. I drag my feet up the three steps of my stoop with all the energy I can muster, reach into my mailbox, sure I'll find an AARP card or a new bill to keep Sallie Mae company and add to my woes. As I move my hand deeper and feel for the bottom of the cold tin box, my fingertips touch the corner of cardstock. I clutch the paper and quickly pull it out to reveal a cream colored card from the US Post Office. I have a package. I HAVE A PACKAGE! This changes everything. The heavens open. The animated little grey storm cloud that has been hovering over my head all day is gone (and that grey hair? Must have been a reflection off the clouds. If not? Isn't that what Nice & Easy is for?). The birds chirp. I skip down the steps, my world is suddenly animated and I break out in a musical number. Yes, for some reason, God has not only blessed me with amazing friends who send me packages, but he's blessed them with impeccable timing. Their packages of red velvet cookie bars and strawberry preserves (and other random lovely items) seem to come on days when I just need a bowl of ice cream, a hug and a good friend to kvetch to from across a kitchen table. In the absence of the actual presence of the sender, I take to gushing on Twitter and doing some sending of my own. After the latest round of food swapping with Twitter-turned-real-life friends, a few other mutual blogger friends caught wind of our mail-order sweets swap and wanted to start a formal group. After all, as food bloggers, we often find often find ourselves drowning in food from recipe testing. (In grad school, I baked so much that I couldn't pawn it off on people fast enough. My suspicious whispering to students--"psst. There's pie in the office!" --got me the nickname Pastry Pusher). Once we feed our friends, families and coworkers, we're sometimes still left with delicious edibles! So, after a chain of tweets from a few lovely ladies, The Leftovers Club was born! Each month, we are paired with another blogger who we'll send easily transportable but not-easily perishable goods (think cookies, brownies, biscuits, etc) to. We bake. We share. We ship. We blog. We post. We eat! It's a wonderful concept and best of all, it's not too late to join in! If you'd like to be a part of April's swap, head on over to Jen's site, Savory Simple, to sign up. She did an amazing job with the logo and organizing this whole group. (Thank you, Jen!!). For the inaugural swap, I wanted to send treats that I took comfort in at one point. I never had much luck with birthdays until a few years ago. For my 21st birthday, I traveled to England to visit my best friend who was studying abroad. Two days into the trip, I came down with a nasty sinus infection that didn't leave for weeks. Though I was miserable on the 6 hour plane ride home, I took comfort in McVitie's Digestives, caramel-covered whole wheat cookies. 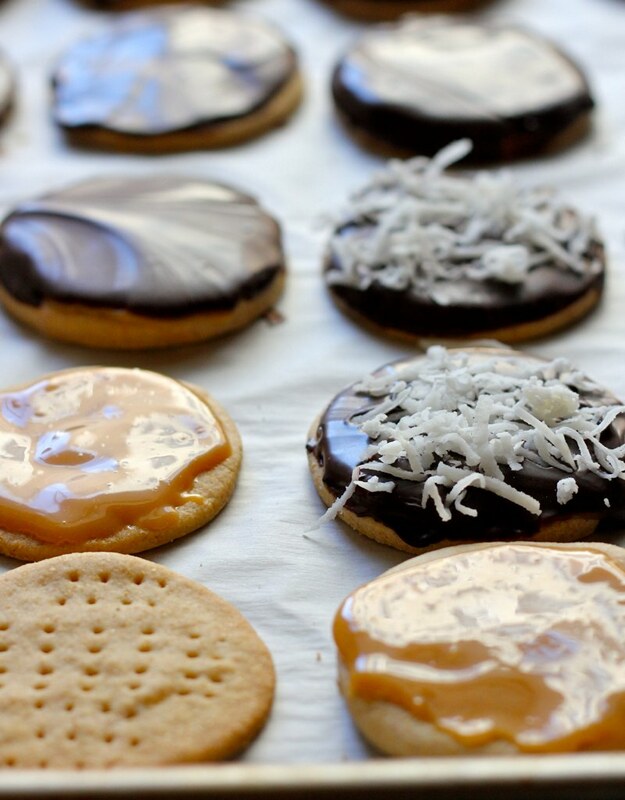 If you've never had a digestive cookie before, there's not much to them, flavor-wise. I'd equate their simplicity to that of an animal cracker--not a remarkable flavor, but despite the blandness, you find yourself reaching for another one. They're perfect with a cup of tea and much more addictive when covered with caramel and chocolate. As a play on that variety, I covered these with dulce de leche and chocolate and sprinkled a few with sweetened shredded coconut. 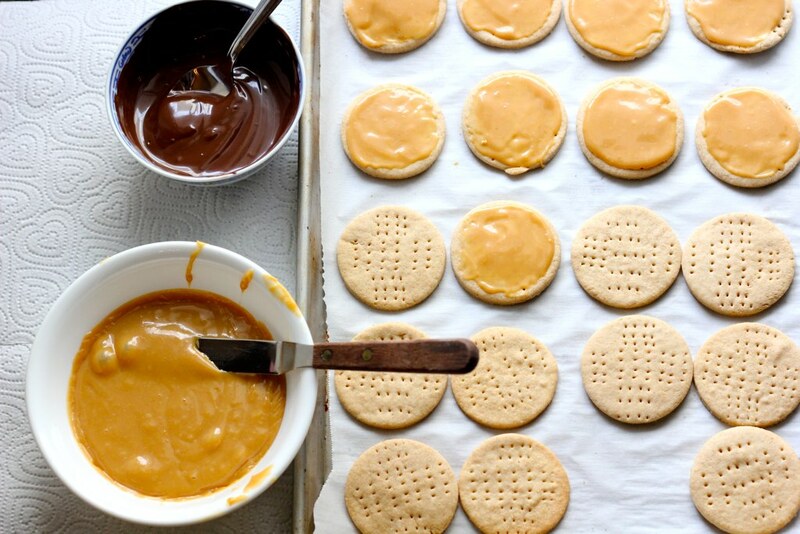 They're pretty versatile, if you couldn't already tell ;) These Dulce de Leche Digestive Cookies come together in no time, so get out your rolling pin, gather a few ingredients and send someone a little bit of baked comfort. You never know when they'll need it! ** Want to know what the other folks are baking, sending and nibbling on this month? Check out their posts! online to learn more and sign up! Disclaimer: I was given a coupon for a free 5 lb bag of King Arthur flour having won it during the Blog and Bake Google on Air Hangout. I was not compensated for this post. I recommend KAF because I used it in this recipe, it's a quality product and therefore, all opinions expressed are my own. This original KAF recipe called for 3/4 cup confectioners' sugar, but because I was adding sweet dulce de leche, I cut back the amount of sugar and added more whole wheat flour. If you rock a mean sweet tooth, feel free to refer to the original recipe. In a bowl (you can use a hand mixer with a medium bowl, stand mixer or your food processor. I used a food processor. ), combine the flours, salt and baking powder. Cut butter into the flour mixture using a pastry cutter, your fingers, the paddle of your stand mixer or the pulse feature of your food processor. Next, add the confectioner's sugar and mix to combine. Add enough milk to make a stiff dough and then knead on a floured surface (or whiz in a food processor) until smooth. 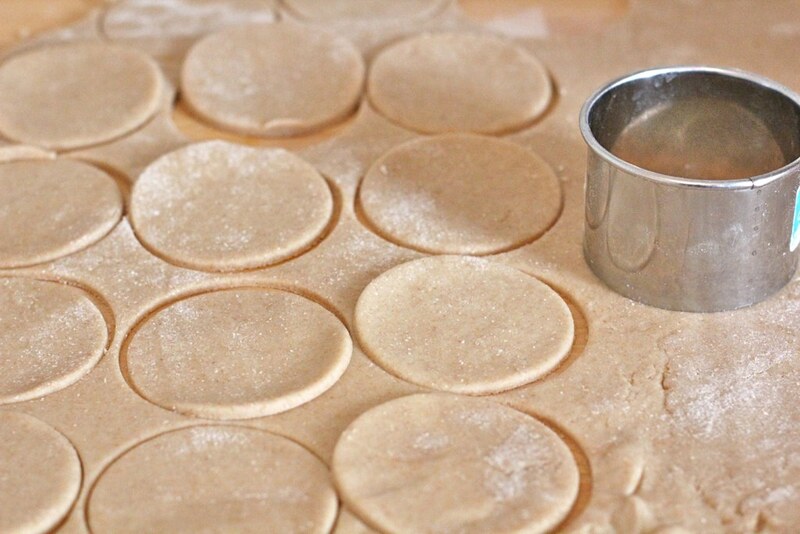 Roll out dough on floured surface until dough is between 1/8-1/16" thick. 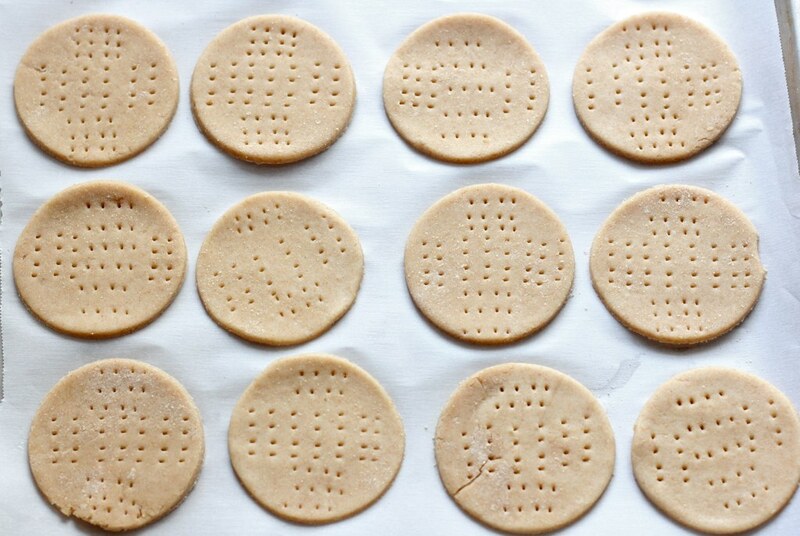 Using a 2" round cutter, cut circles and place each round onto a parchment lined cookie sheet and prick each cookie several times with a fork. Bake cookies until just slightly golden, roughly 18-20 minutes. Allow to cool 5 minutes before transferring to a cooling tray. 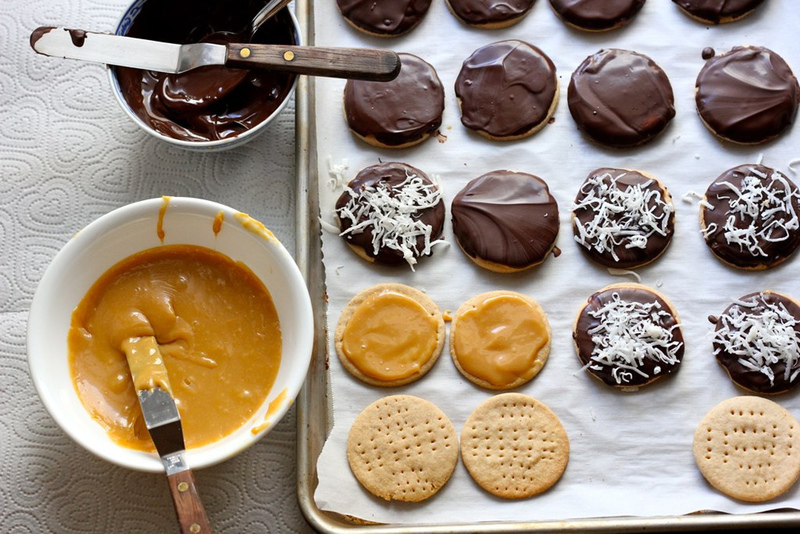 Once completely cool, spread a hazelnut-sized amount of dulce de leche on each cookie. Allow to set 10 minutes. Meanwhile, melt chocolate. Once dulce de leche has set up a bit, spread a small amount of chocolate over the dulce de leche. Place back on the cooling sheet to set up. Sprinkle with nuts or coconut if desired. Prepare to eat chocolate covered comfort. Like this post? Subscribe & get posts in your inbox!